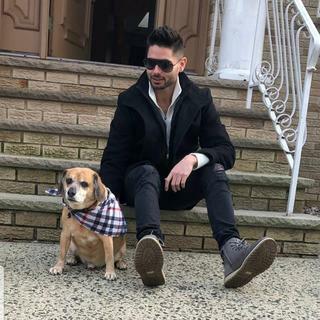 Well good morning everyone and before I forget Buona Pasqua--Happy Easter, as I prob wont be on tomorrow. Yes the title is true. I fully expect snow to fall fom the sky Monday morning. Let quickly take a look at the set up. Late Sunday afternoon into early Sunday evening(between approx. 4pm-6pm) a cold front will pass through the area bringing with it the potential for some light spotty showers. After the cold front moves through it will stall somewhere to the south of LI. This cold frontal passage will be vital to setting us up for this snow potential for Monday morning. The reason being is that upon its passage the winds will shift out of the NNW for the remainder of the overnight hours as high pressure builds in to the north which will do two important things. 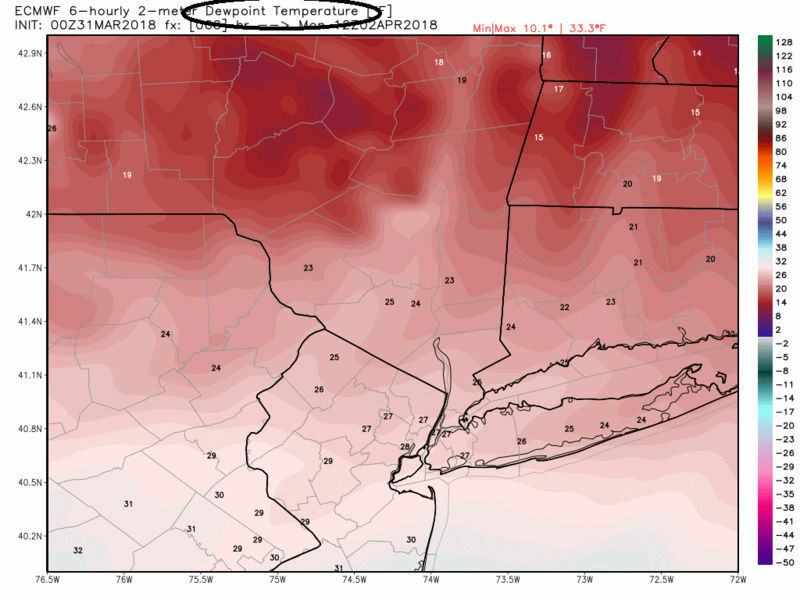 First it will drive down surface temps into the lower 30's area wide and second it will drive in very dry Canadian air dropping dew points into the mid-upper 20's area wide. 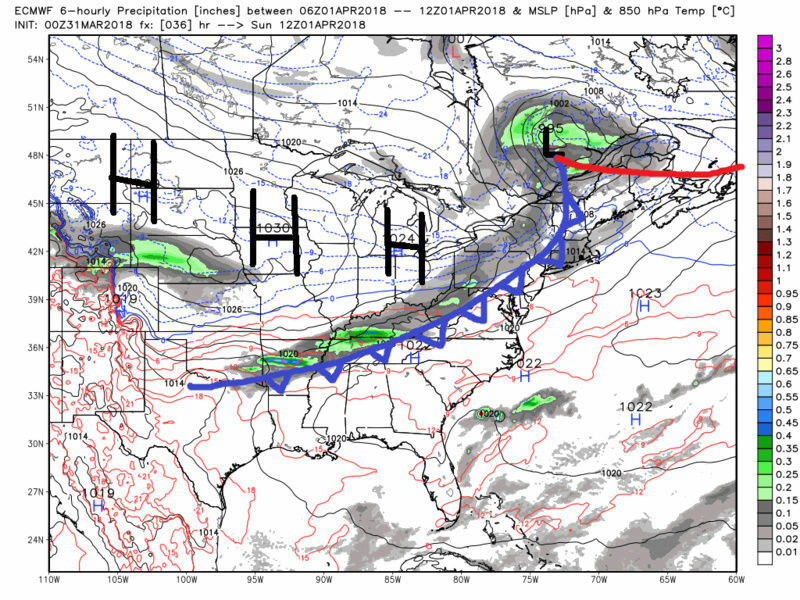 Weak waves of low pressure will develop along the frontal boun and warm air advection out ahead of the LP will ride up and over the frontal boundary triggering the precipitation shield. 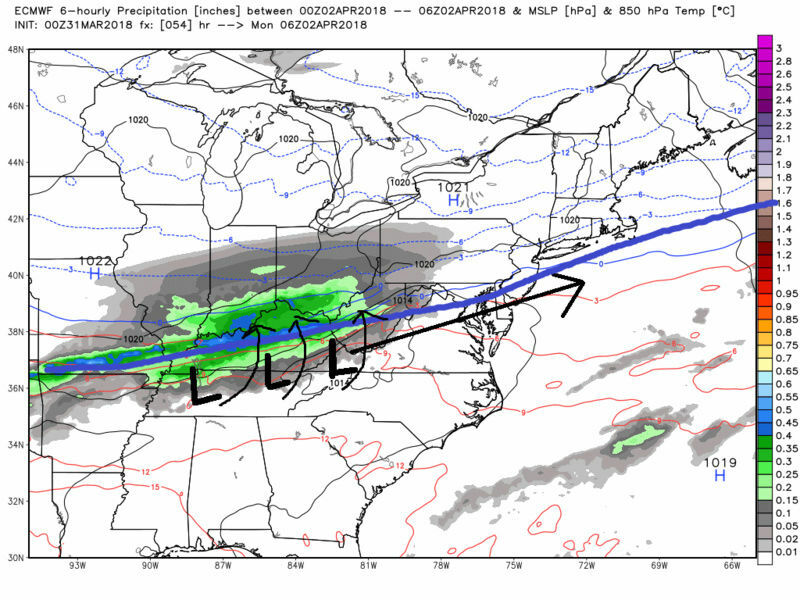 Initially there could be some enahncement to the precip shield as it passes over the mountains of W. Va due to up sloping and upper air divergence due to a favorable position in the R rear quadrant of a 300mb jet streak to the north. However the jet streak appears to weaken as it cont east and passes over and then off the NE coast while a second streak develops back west which then places the surface LP center in more of the the R front quadrant which typically yields upper air convergence, a condition for weakening of surface LP. There are subtle differences in the modeling to these jet streak features in timing, placement and intensity but I don't expect any real strengthening of the low pressure as it reaches the coast. That means we have to rely on other mechanisms to enhance lift over our region. 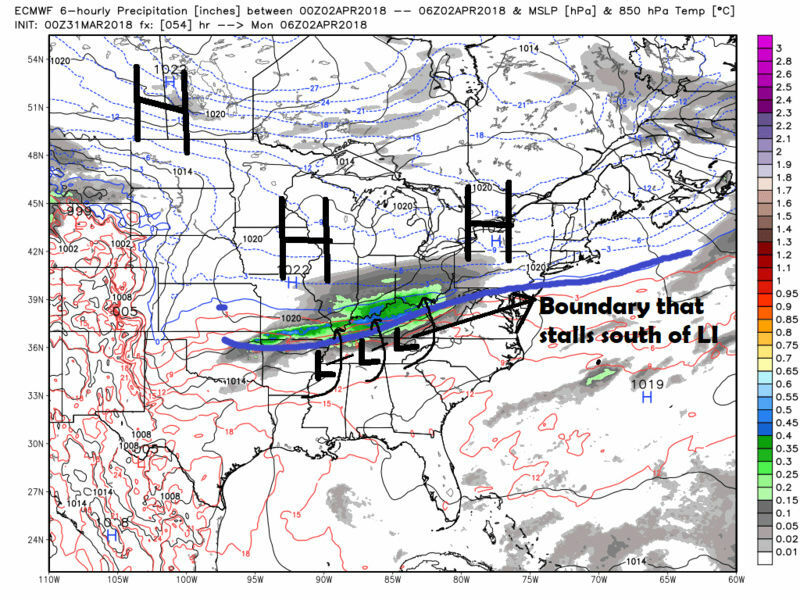 These set ups however can often times yield surprise higher snow totals for a narrow band of real-estate, not due to an intensifying/deepening low pressure, but rather due to enhanced lifting mechanism from frontogenesis and the baroclinic zone. The warm air to the south is making the spring push north, and the cold Canadian air to the N is still trying to push south so you get a large temp gradient over a relatively small area (baroclinic zone). The tighter the gradient, the stronger the lifting mechanism; therefore, the more intense of a snow band we might expect. Looking over the various modeling the 850mb frontogenesis seems to be unanimously modeled to be over the Delmarva and S jersey; a little too far to our south to enhance snow totals over our region. However, the 700mb frontogenesis forecasts do have some enhancement in and around parts of our area. But the intensity of which and exact placement of which has varied a little run to run and model to model. There could be a period of 1-3hrs underneath this frontogenesis where a narrow band of intense snowfall could put down a very quick 2-4". With surface temps in the lower 30's and dew points in the upper 20's as the precip moves in this will allow for dynamic cooling effect to take place. This means that as the precip begins to fall the physics of evaporative cooling will lower the surface temps further. If you were in the mid 30's youll likely get into the low 30's. If your in the low 30's you'll likely get into the upper 20's. How low it can go is somewhere between the surface temp and the dew point temp for any given location. The harder the precip the faster the temp falls. So with a starting point at the surface in the lower 30's before the precip moves in I expect while the precip is falling the entire area "should" accumulate on grassy surfaces at least. Of course the heat Island effect of Manhattan and the surrounding urban boroughs will likely have the toughest time accumulating if at all. The timing of the precip will be important as well. As it stands this will be in and out pretty quick beginning around 5am-9am west to east only lasting for about 6-8hrs. It may start as virga with the dry air in place early. 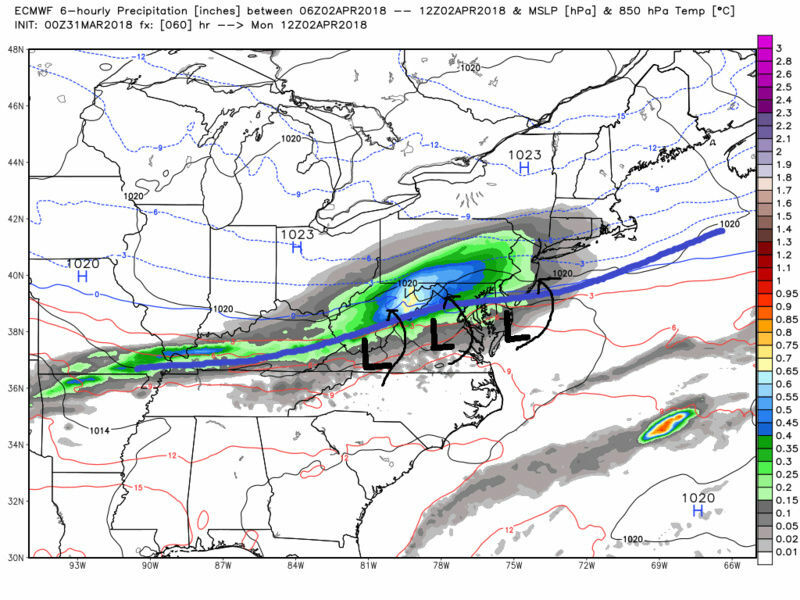 As we all know we are in April, and the sun angle will climb in the sky rapidly so any delay in the timing of the precip, the more likely we only see accumulations on grassy surfaces and or not at all, along the coastal plain esp. 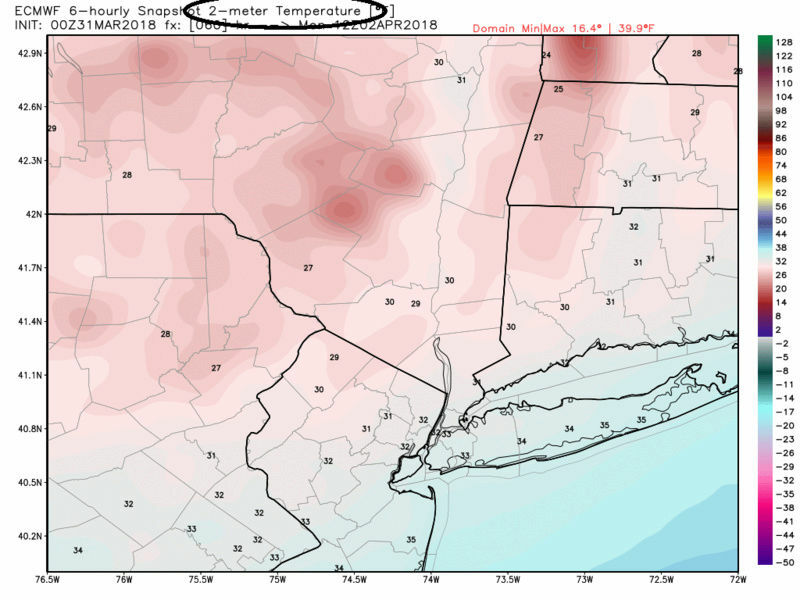 As soon as the precip begins to end expect surface temps to quickly shoot up into the mid-upper 30's and the melting will be fast so measure before the snow ends. Great write-up Scott. I think this covers all the bases on this one. Start-time and that west-to-east heavy band location will be the two biggest things to watch for accumulation purposes. Regardless any snow in April is a blessing for snow lovers so let’s embrace it! Jman they used your favorite phrase again..
Holy Crow, 3 inches! I'll be happy with 1 to 2 to get me above 80 inches for the season! 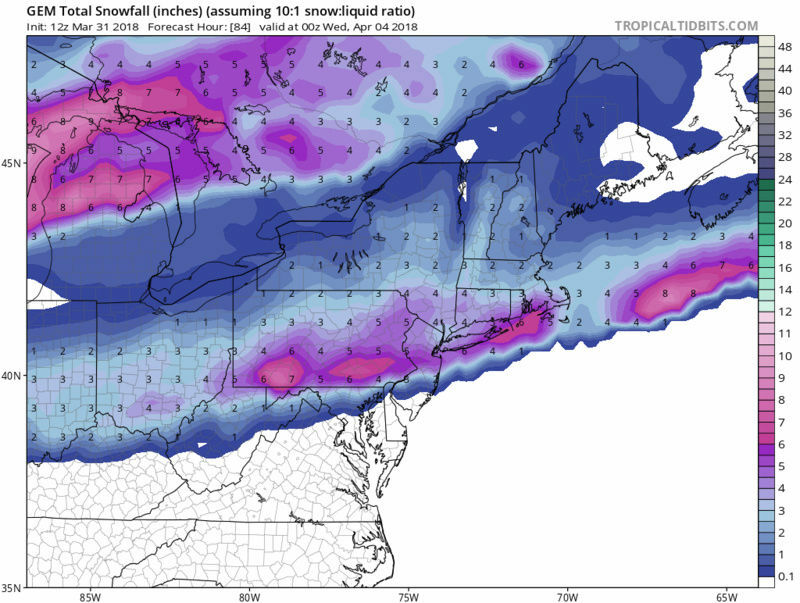 12z NAM coming in north!!! 12z NAM has it as an area-wide 4-6” event. That may be a bit ambitious but fun to contemplate. Lol. 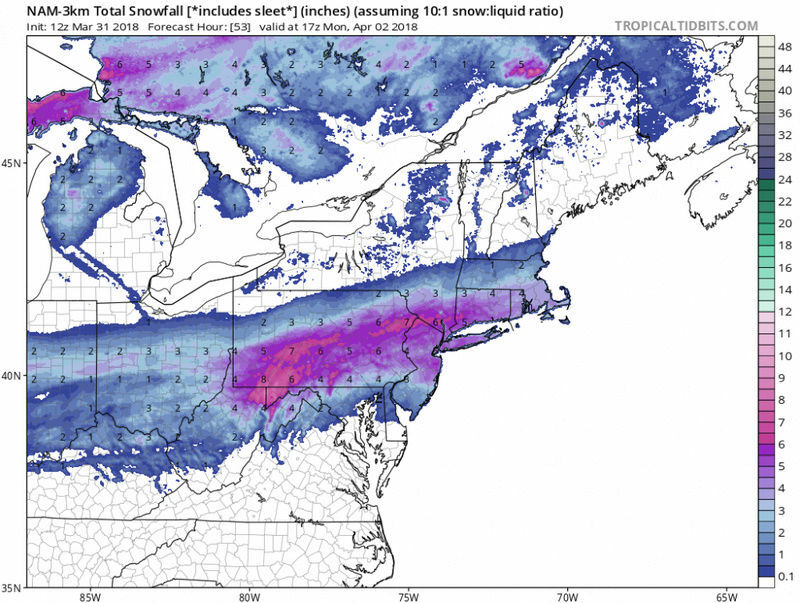 3km NAM snow map, the 12km NAM is very similar. The Spring that just keeps on giving. GFS want to play too..
EURO has a 3-6 snowfall for the entire area on Monday. They might have too. All the models have come come in more north/amped today. Hmm..last night my mother hung up on me and now my husband gave me a dirty look and told me to keep my snow news to myself.. ..do we really have a chance of snow?? It's a Yankee tradition Frank. There are not many bigger Yankee fans on the planet than me and in my 56 years here I can remember at least three Yankee opening days in April that were snowed out or snowed during the game. The first one of course was the April 6, 1982 blizzard when a foot of snow blanketed most of the city and up to 20 inches in some of the suburbs and the Yankees home opener was delayed for three days so they could shovel out the stadium which still had snow surrounding it when the season was opened three days later on April 9. The second time of course was the April 9, 1996 home opener which was played despite the fact it was 35° during the entire game and it snowed during the entire game a few times in the late innings heavy but for the most part didn't stick to the grass although it did whiten the outfield a bit at times. The third time of course was the April 7th 2003 opener which was canceled till the next day because 4 to 6 inches of snow blanketed the city that day. Of course the next day the first pitch was thrown with snow still covering the Bronx and the game time temperature of 34°. Charlie Rosen who was doing Yankee games on radio then opened up the broadcast with the classic line "welcome to Yankee Stadium everyone on a beautiful day to play baseball", and he paused, "somewhere in the world but certainly not here today". If Monday, April 2 makes it the fourth time in the last 36 years, so be it. Like I said it's becoming tradition. syosnow94 wrote: Jman they used your favorite phrase again..
blah blah don't care lol. I'd prefer it stay dry and sunny and that's what I'm banking on. Pretty elaborate April fool's joke with making a thread and fabricating weather bell and tt maps wow lol. If it does snow I will measure on a frozen board. 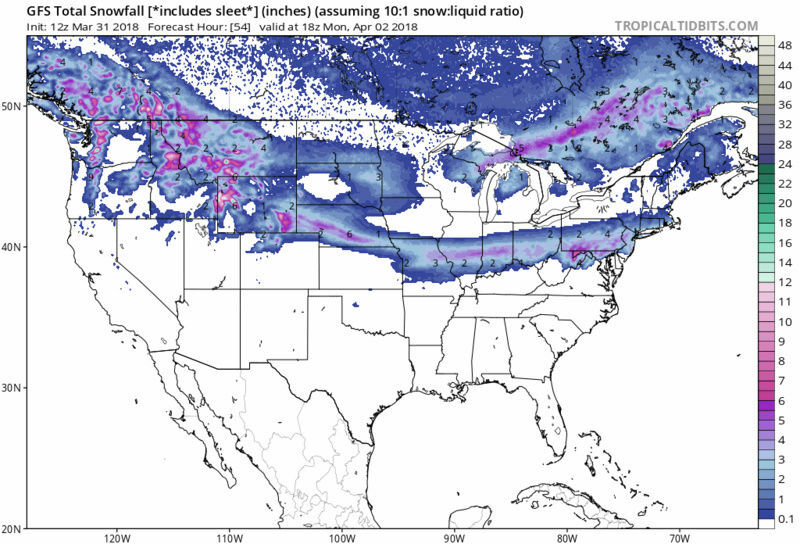 Snow totals should be bas d on what falls from the sky not what's actually on the fround. To me that yields very unreliable snow totals. Those maps should show a blank spot around NYC if it's not go stick. It's 2018 maps should be able to account for this. I still remember walking through a slushy snow grumbling about the Phillies opener (against the Mets - for those with a thing for baseball trivia, the matchup was Steve Carlton vs Pat Zachary) being postponed by snow of all things (I think I was more upset it didn’t cancel school). Here is an April 7, 1982 NYT story showing the havoc that system caused with sporting events. 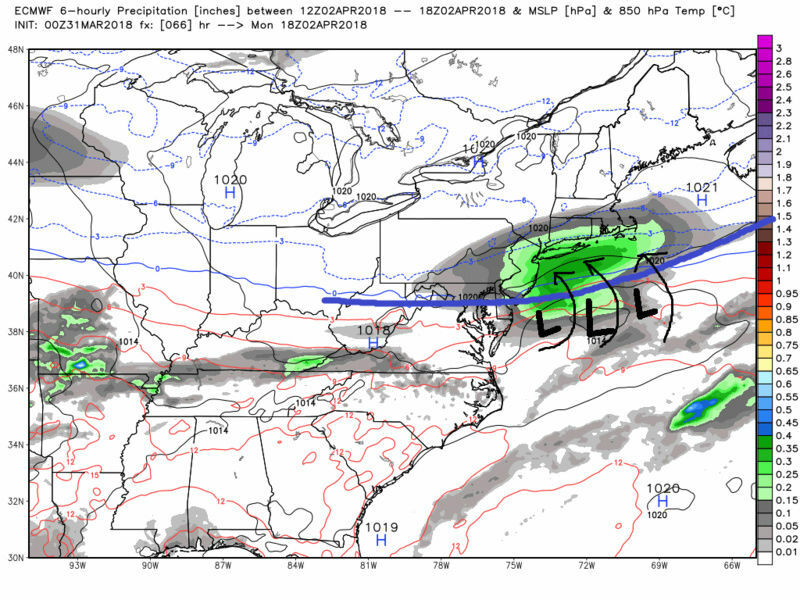 18z NAM holds steady with start time (4or5 am) and heaviest snow band from central/north NJ in NYC metro. General 4-6” storm for most of the board. I’d throw this out for Scott, Frank or anyone else. The 18z NAM seems to have the heaviest snow bands in North Jersey but depicts the strongest frontogenesis pretty deep in South Jersey. Is that not inconsistent? As I look now it does show some 700mb frontogenesis further north so I guess that’s where it’s getting the enhancement. billg315 wrote: As I look now it does show some 700mb frontogenesis further north so I guess that’s where it’s getting the enhancement. A general 2 to 4 inches of snow across the area but I can see areas N&W of NYC with 4 to 7 inches. It's going to move in overnight Sunday. Heaviest between 6 and 8am Monday. Should be out by mid morning. Sorry for my post earlier, was joking around and had a bit of the drink started my holiday week off early. I am glad most will be seeing snow, I am just going to see what happens but assumingly there will be no accumulation here. Thats okay, and yeah I guess in terms of uncommon April snow goes it is pretty cool frank. 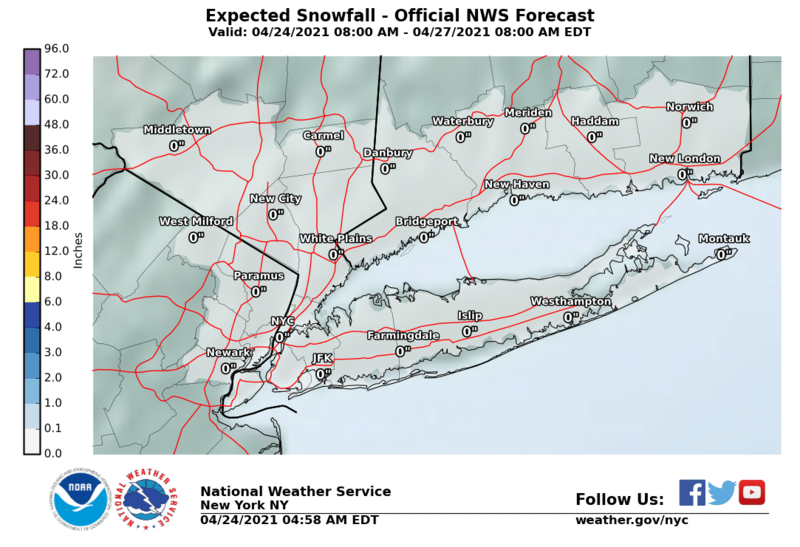 Wish I was NW of NYC then I would be excited but just to late in season. 45 inches for the season is not too bad here, it tops last year. Wish it had come in more lump big storms but at least I can say we were well above normal.